Pros: An excellent company attack the story with vigour and enthusiasm. Cons: Noise from customers watching the football downstairs was occasionally distracting. A funny, lively interpretation which manages to tell a complete story in 45 minutes. 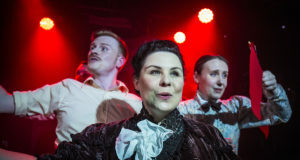 Another day, another review and fate brings me back to the Etcetera Theatre on Camden High Street which is fast becoming one of my favourite pub venues. A further instalment in the Black Box Festival, Oyster Boy is the tale of Jim and Alice, a couple whose lives are turned upside down by the arrival of their son born with an oyster for a head. Inspired by a collection of short stories by Tim Burton, this show is a glorious mix of physicality, music and puppetry. 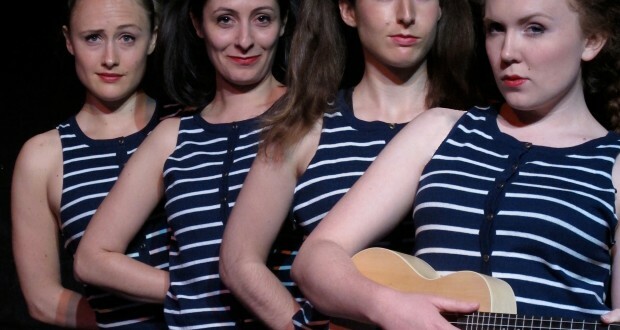 The Haste Theatre is an international, multi-disciplinary theatre ensemble specialising in the European theatre tradition of physical expression, chorus and live music. 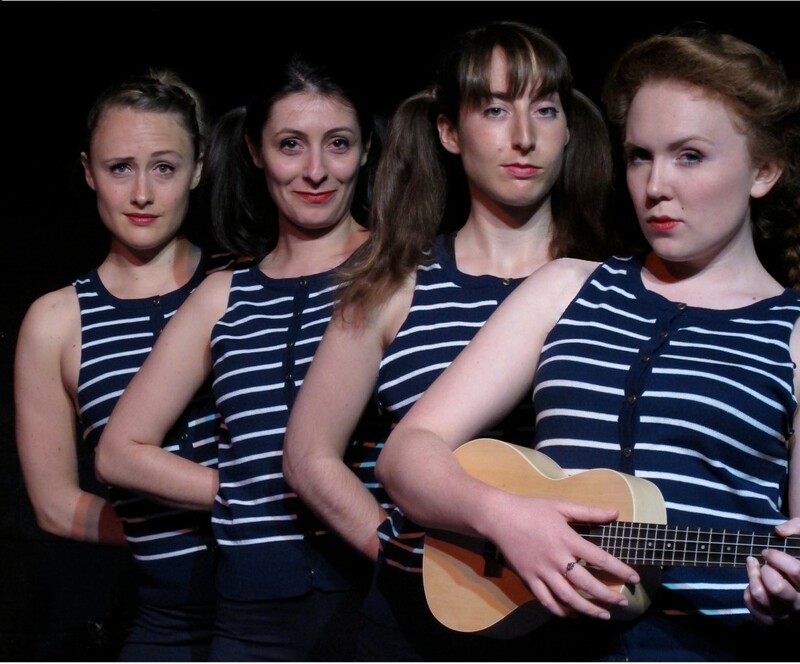 The six strong company are charming, attractive and engaging; Elly Beaman-Brinklow, Sophie Taylor, Jesse Dupre and Elena Costanzi provide the story’s vocal accompaniment; they also fill a variety of other roles including doctor, stern mother and excitable schoolgirls, Molly and Polly; while Valeria Compagnoni and Anna Plasberg-Hill play Jim and Alice, parents to Sam, a special child with very special needs. The story begins with Jim and Alice meeting at the seaside, they quickly fall in love over a candlelight dinner of oysters and later await the birth of their first child. Sam arrives with a predictable reaction from those close to the couple. Jim’s livelihood as an ice cream salesman appears to be in danger as they fight prejudice and ignorance. As Sam grows, his only friends are schoolgirls Molly and Polly, who defy their mother by spending time with him in secret. Doctors argue and deliberate over Sam’s condition and see him more as an intellectual challenge than a human being. The tale concludes with a surreal, visually stunning flourish using the most basic of props. The story gives more than a passing nod to Elephant Man, and while it approaches the subject matter in a light hearted way, it still manages to present the same moral question: why should we be suspicious or fearful of someone who is simply different? What particularly impressed me was the balance and pace of storytelling; it was a complete and well-rounded story which is quite an achievement in only 45 minutes. 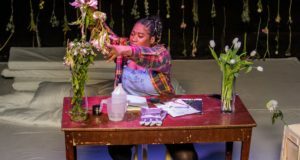 The Haste Theatre are bright, original and inventive performers and would like to see them in a much bigger, expansive setting; but even so they are well worth seeing in the intimacy of a small venue.